Like vitamins and minerals, water is essential for good health. It is found in every cell, organ and tissue in your body. You may find water too boring to drink, so to stay hydrated, reach for beverages loaded with calories and carbohydrates. If you're looking for a lower-calorie and low-carb juice that does not contain sugar substitutes, consider giving cucumber juice a try. Cucumbers originated in India, and came to North America in the 16th century. Cucumbers are a summer vegetable and a member of the same family as squash and watermelon. They are low in calories and can help you meet your daily vitamin C and vitamin A needs. 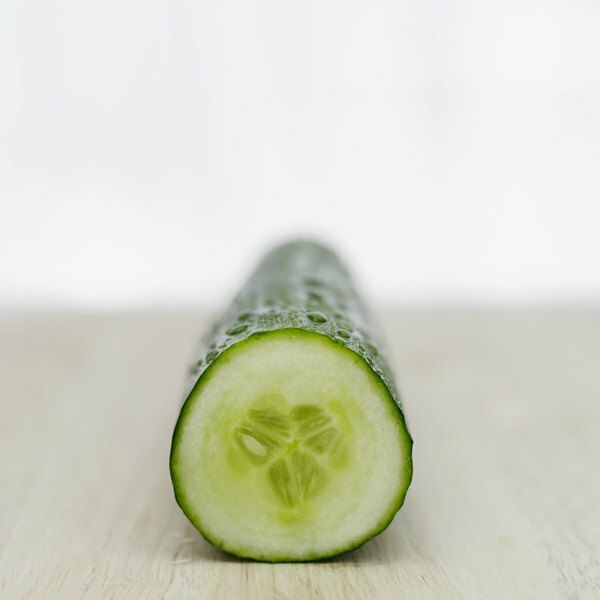 The low-calorie content of the cucumber is due to its high water content. A 4 oz. serving of cucumbers contains 2 oz. of fluid, which is why the cucumber makes a good juice choice. Just like the cucumber itself, cucumber juice is a low-calorie juice, and very low in carbohydrates. A 1/2-cup serving of homemade cucumber juice contains 34 calories and 2 g of carbohydrates. Cucumber juice is significantly lower in carbohydrates than other vegetable juices. By comparison, a 1/2-cup serving of various mixed vegetable juices contains 5 to 8 g of carbohydrates, and 1/2-cup serving of carrot juice contains 7 g of carbohydrates. Like water, carbohydrates are also an essential nutrient. They provide your body with its preferred source of energy, and are the nutrients your body needs in the largest amount. A healthy and balanced diet should get 45 to 65 percent of its calories from carbohydrates. On a 2,000-calorie diet that means about 225 to 325 g of carbohydrates a day. Most of your carbohydrates should come from healthy sources, such as fruits, vegetables, whole grains and beans. While the cucumber juice makes a healthy carbohydrate choice, it is not a significant source of carbohydrates. Cucumber juice is easy to make. Simply puree peeled cucumbers with water and ice and enjoy. You can add other ingredients for flavor such as ginger, mint or lemon, without adding calories or carbs. If you don't like pulpy juice, you can strain it through a cheese cloth. Some cucumber juice recipes also use sugar. But adding sugar will increase the calorie and carbohydrate content of the juice. Are There Benefits of Drinking Orange Juice & Grapefruit Together?